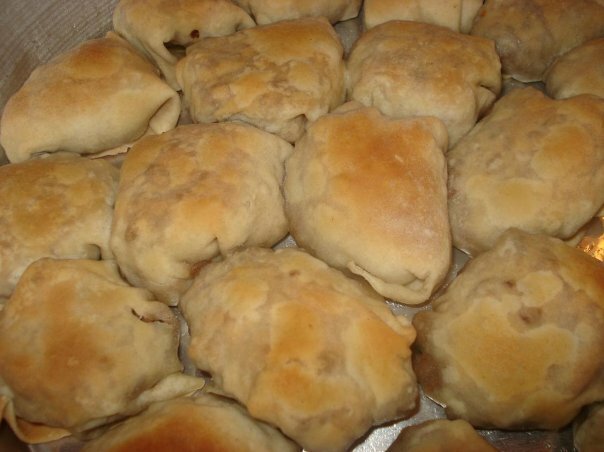 A similar concept to popular Turkish Borek, these meat parcels are eaten in the Balkans, mainly in Kosovo and Bosnia. Mantija are most probably an influence from the Ottoman empire’s presence in the Balkans. ‘Manti’ eaten in Turkey is a distant relative to Mantija but they are boiled, not baked. Preparation: Sauté the mince and onion on a high heat until cooked through and golden brown. Season with salt and pepper. If making own pastry, use the same pastry recipe as in Borek until you have 6 doubled up discs. Roll out as large as possible and cut into diamond shapes (roughly 2” x 2”) using a sharp knife. If using shop bought pastry, cut into 2” x 2” squares. Place a spoon full of filling in the centre of each diamond. Create parcels by pulling each corner over the top of the meat and place upside down into an oiled baking tray, until the tray is full of snug fitting parcels. Mix yoghurt with egg and oil. Pour over parcels and leave for 1 hour. Bake on a medium heat until golden brown. Mantija are best eaten warm accompanied by Ayran, a popular salted yoghurt drink. Very nice indeed! Yor website is an international culinary treasure.